Expressing light in perfume without going with the usual suspects of super bright citrus and a bucket load of yellow flowers is quite a challenge. Natural perfumer Mandy Aftel of Aftelier took it on and succeeded when she created Lumiere. Lumiere opens up bursting with light, incense and exuberance. It's light that hits old pine trees and reflects on the water in a dreamy fragrant garden. Most natural perfumes smell like real, earthy places. Mandy Aftel's Lumiere comes from a fantasy world. I'm trying to avoid the cliche of a scene from Lord Of The Rings where you see the elves riding in the forest on their way to leave Middle Earth and the lights filters through the trees and illuminates them in a beautiful, eerie and heartbreaking way all in the same shot. But there's something in Lumiere that calls to mind Japanese minimalism. Maybe it's my imagination running wild with the green tea and blue lotus. What's obvious is the airy and unfussy quality of Lumiere. It spreads from the skin out, a little sweet, a little salty and also a little weird, in the best possible way. Despite the green and outdoorsy notes that make Lumiere, the way it interacts with the skin is the biggest surprise here. Mandy Aftel managed to create not just an image but also a personal, intimate perfume. My only gripe is longevity. I've gone through my sample in no time because Lumiere is mostly gone in less than three hours and I'm yearning for more. Heart: honeysuckle, blue lotus, boronia. For more reviews of this perfume you can visit Scent Hive, Bittergrace Notes and Perfume Smellin' Things. Lumiere by Aftelier ($195, 30ml, samples are available for purchase) can be found at aftelier.com. My sample was part of a gift bag from an industry event. 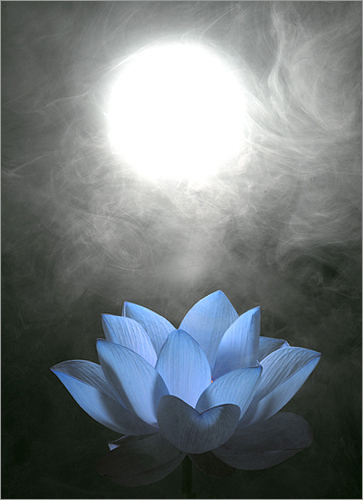 Art: Blue Lotus by Bahman Farzad. I have this perfume (and a few others from Mandy) and this is one of my favorites, it's so soft and lovely. My other love is Parfum Prive-she works magic with ambergris! Thank you so much for this lovely review. I wanted to create a perfume that was sheer in texture and not earthy at all -- which as you know is sometimes difficult with an all natural palette. I am so glad that you highlighted this. Gaia, I don't know how long you spend finding the perfect image to accompany your posts (whether it's art, like this post, or celeb photos for other posts), but you so often find something great. Just wanted to say it's appreciated! Today's image and post stopped me in my tracks as I was scanning quickly to catch up on backposts I've missed recently!